Hamaganza | Hardywood Park Craft Brewery | Happenings | Style Weekly - Richmond, VA local news, arts, and events. 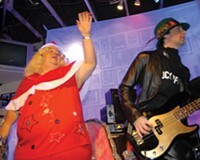 Richmond's favorite ham-themed holiday that mixes music, journalists, politicians, burlesque performers and Dirtwoman. Have yourself a different little Christmas.